In Harmony is a charming beachfront villa that would be perfect for your next family vacation. It has a private beach just beyond the deck with a rocky shoreline that adults can swim easily, and there’s kayaks to paddle along the coast. Kids and adults alike will love combing the beach for sea glass, starfish, and shells. The oceanfront pool is surrounded by a large deck and loungers, so parents can easily keep an eye on kids splashing around. To top it off, the villa has flowing living spaces with tall windows that face the sea, and each room flows seamlessly into the next. In Harmony sits on South Sound Beach near the center of the island’s southern coast. This fully air-conditioned, two-story villa is ideal for family vacations and group getaways. The terrace has a large pool to swim in and loungers to sunbathe on, all elevated above the white sand beach. Float along the coast in the villa’s kayaks, or nap in a hammock under the veranda. Barbecue on the grill and eat al fresco with an ocean view, or sip cocktails as the stars come out. Retreat to the air-conditioned interior to watch TV in the living room or read a book from the personal library. Several guests can relax on the oversized sectional, and there’s a lounge area in the entryway for a little more privacy. Cook with friends and family on the kitchen’s stainless steel appliances and wrap-around counters, or simply enjoy a cup of a coffee from the Keurig. Eat around the breakfast bar or formal dining table, then retreat to the lounge to read a book or catch up with fellow travelers over drinks. In Harmony has four bedrooms total, each with a TV. The master bedroom has a king-sized bed, entertainment system, and access to a private balcony. Its ensuite bathroom has a rain shower and soaking tub. The king guest suite has terrace access, ocean views, and an ensuite bathroom with a rain shower/bathtub combo. The queen guest suite has a lounge area with a video game console, as well as terrace access and an ensuite bathroom. The children’s suite has a twin/queen bunkbed and a twin bed, and access to the hall bathroom. Pack-n-plays, booster seats, and baby monitors are available, and housekeeping and grounds maintenance will keep the villa in shape. 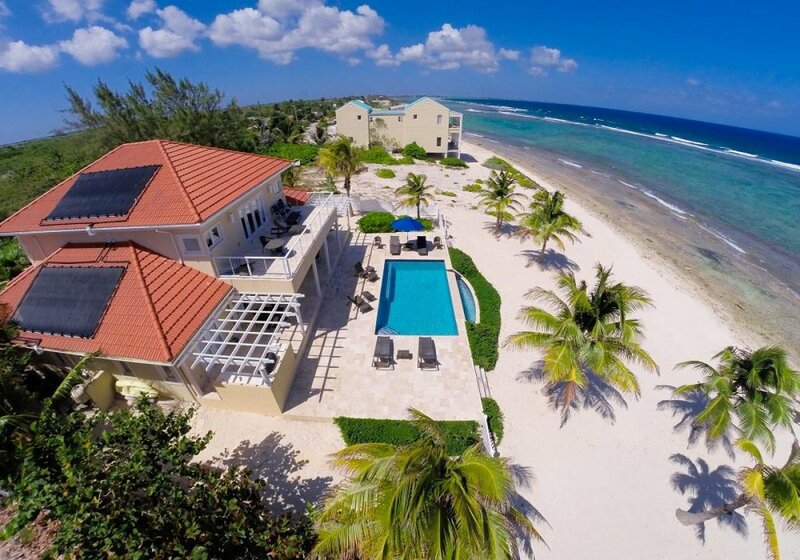 This Cayman beachfront villa is only a mile from restaurants, groceries, and water sports. It has direct access to a private sliver of Bodden Town Beach, and is 5 miles from Spotts Beach. Private 75 foot stretch of rustic, rockier beach shoreline. Shoes are recommended if you would like to enter the water, but are not necessary for the sandy part of the beach. Pack-n-plays, high chairs, baby gates, and California baby products are offered as a courtesy with advance request. Fabulous experience staying here! In Harmony Villa had absolutely everything you could ask for. We were 6 adults and there was plenty of room plus another free bed to spare! The layout and location of the house was perfect, as was the property manager, Ben. There is a fridge outside by the BBQ, but do NOT leave anything in it overnight - we learned that one the hard way ;) The only thing that would have made this stay even better would have been if they had turned on the heat in the pool, as it was a bit too chilly to be enjoyable - but we laid around it and took quick dips! Sharon was great all around! The Villa is immaculate! The Location is Perfect! You will find yourself out somewhere and wondering why you ever left. You have everything you need right there! The house was pre-stocked with Food and Liqueur that we requested. Clean, Clean, Clean! We highly recommend it! The Experience was very easy and look forward to using your services again on other vacation getaways. We would also like to make sure we reserve our spot at In Harmony Villa again for next year.